No, buying the dips will not make you rich. To say that cryptocurrency markets are volatile would be an understatement. Compared to the stock and forex markets, the cryptocurrency market appears to be moving in fast forward. It often experiences significant variance throughout the course of a day. Being so volatile, it is quite possible to make extraordinary gains over short time frames. However, it is similarly possible to everything in just days. You have probably heard the phrase: ’90 percent of traders lose money, only 10 percent win.’ Well, in fact, it is estimated that 96 percent of traders lose money and end up quitting. So if 96 percent of traders lose money, what do the 4 percent of profitable traders do differently? As with all endeavors, mistakes are almost inevitable — particularly in the crypto environment which is both much more volatile and unpredictable than traditional markers. Today, we will be looking at the cryptocurrency trading mistakes that the four percent of successful traders tend to avoid, helping you avoid the newbie mistakes that might otherwise leave you holding the bags. Learning how to use a variety of market indicators is typically one of the first points on any novice trader’s to-do list. However, it’s easy to get lost between the plethora of available indicators. You have the RSI, MACD, SMAs, EMAs, and dozens of others to choose from. It is a common mistake to think that you must fully understand all of these before you can be profitable with trading. The truth is, some of the most effective traders out there use very little technical analysis, typically relying on just the volume and price candles to make their trades. You might be thinking, “surely there’s never too many indicators?” In actuality, too many indicators can hurt your opportunities — particularly when different indicators paint opposing pictures — hence causing you to skip what could otherwise be a profitable trade. Besides this, many indicators overlap. For example, divergences and trendlines can be derived from a single indicator — the RSI. Particularly in the early days of trading, you might be eager to try to complete as many trades as you can. After all, more trades equals more money, right? To be a profitable day-trader, you don’t have to trade as often as you might think — with typically only a few trades per week being needed to generate a healthy return. By avoiding over-trading, you can often avoid significant losing streaks that might otherwise severely damage your portfolio. After all, when the market is down, almost all coins tend to go down with it. Never set yourself a goal for a fixed number of trades per day, as this can lead to making less-than-optimal decisions and force you to take unnecessary risks. Instead, we recommend using a carefully selected set of rules upon which you base the majority of your trades. If you find yourself significantly deviating from these rules too frequently, it may be wise to re-evaluate your trading strategy. Although more advanced traders can frequently profit while not following the general trend of an asset, beginners will often have a tough time doing the same. When almost the entire market is in a downtrend, this tends to make profitable trading opportunities fleeting. 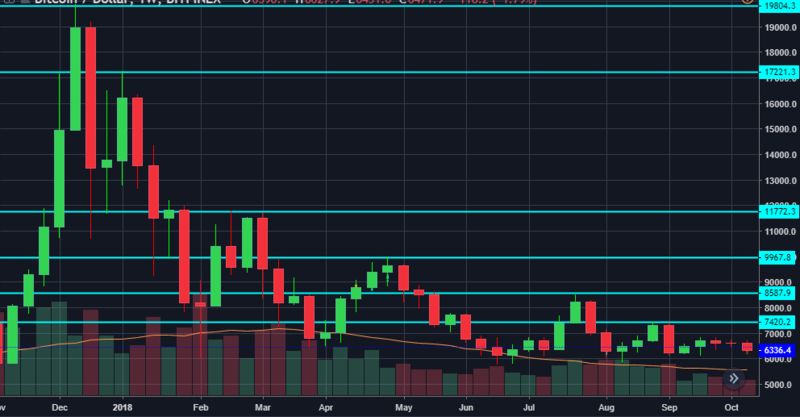 For example, Bitcoin (BTC) has been on a downward trend for close to a year, having begun its descent towards the beginning of 2018. As you can see by the graph below, Bitcoin has consistently failed to break the lower highs indicated by the horizontal blue lines, with each peak being lower than the one preceding it. As you can see, buying Bitcoin at any point in 2018 so far would have more likely than not lead to a net loss, because the overall trend was bearish. In cases like this, it is a safer bet to short rather than going long, as you will tend to come out on top more frequently. Until you get the hang of it and can recognize opportunities between peaks, it is best to err on the side of caution. The stop loss feature offered by most cryptocurrency exchanges is one of the most valuable tools a trader can use and can protect you against a heavy loss in the right conditions. However, many new traders make the mistake of placing their stop-loss too close to the initial buying price. As we previously mentioned, Bitcoin and cryptocurrencies, in general, are highly volatile, which can lead to a close stop loss being triggered before the price has had a chance to climb — potentially losing out on an opportunity that had a small dip before a big climb. It is extremely important to acknowledge support/resistance lines when setting your stop losses, even if it means you could lose more money. These support lines represent points that are difficult to break under normal conditions — typically where a strong buy wall lies. Using the above graph as an example, if you had purchased Bitcoin at $5,926, you might be tempted to set your stop loss somewhere around $5,900. However, the best stop loss below this entry point is the $5,758 support line. If you had set your stop loss at $5,900, it would have been triggered shortly after entering, preventing you from benefiting from the rally back to $6,200 just moments later. We recommend using a stop loss for practically every significant trade. It might just save you from an unexpected flash crash. If you do however get hit with a bad beat and end up losing a significant amount of money, we encourage you to avoid making rash decisions in an attempt at a quick recovery. Shortly after making your first moves in crypto trading, it is likely that you will hear about pump (and dump) groups. These are groups that claim to act in coordination to manipulate the price of a digital asset by massively increasing the buying volume before dumping the coin on unsuspecting traders and bots looking to get in on the action. However, the reality is not as rosy as it seems. The truth is, pump groups are almost impossible to profit from. Usually, the admins behind the group will buy up large amounts of the asset prior to announcing it to the group. They will then set their sell orders at a price somewhere significantly higher than their entry point, but low enough that it gets caught in the initial buy wave from the pump group members, making a huge profit. Whilst you may be tempted by the success stories and reviews these groups typically post as evidence of their success, you can just assume these are either outright fabrications or paid shills. While there is technically a tiny chance of making a profit from some of these groups, the odds are overwhelmingly against you. As a trader, your strategy is everything. While it’s typically much easier to profit in a bull market, profiting in a bear one is much more challenging and requires a stringent set of rules. One of the biggest mistakes you can make is blindly following a strategy without understanding how it works or how to apply it. Rigorously test your strategy before applying it with real money. Doing so will see you better prepared for many market events and will likely lead to a better return on your investment over time. Confidence is important in trading. Overconfidence is not. While it is important to be confident about any moves you make, being overconfident can put you in a tough spot when things don’t go as planned. With all trades, we recommend only acting if you have a reasonable degree of certainty. Avoid 50/50 bets, as these will achieve little in the long run. One of the best ways to make confident trades is by doing your homework regularly. The markets can change at the flip of a coin and so to must the strategies you use to trade with. What works in a bull market might not necessarily work in a bear one, so be prepared to toss your strategies to the curb if your results are less than desirable. The general market sentiment matters more than your own. If the sentiment looks bearish, be vigilant and only trade when you are highly confident. If the market looks bullish, then you likely have more freedom in your trades, as making a losing trade becomes more difficult. Due to its relatively small size, the cryptocurrency market can be heavily influenced by the news — whether this is cold hard facts or just rumors. Sentiment analysis is just as important as technical analysis, and the best way to get a grasp of this is by keeping on top of the news. A proper risk-to-reward ratio is one of the most important aspects of trading. Beginners tend to think that the only way to profit in trading is by having more winning trades than losing ones. However, it is quite possible to lose more often than you win and still come out with a profit. For example, having a 90 percent winning strategy with a poor risk-reward ratio can actually see you lose money overall, while a 40 percent winning strategy with a 3:1 risk-reward ratio can generate a healthy profit. In the previous example, in 4 out of 10 trades you’ll win 3x your investment. If each trade is $10, then you’ll have earned $120 after risking $100 in 10 trades. Compare this to a 90 percent winning strategy with a 1:1 risk reward ratio. With this strategy, although you win more often, you will still be down an average of $10 after 10 bets. Because of this, it is important to focus on achieving good risk-to-reward ratios, rather than winning every single trade. By nature, humans are designed to be greedy. However, being greedy in trading can have disastrous consequences and seriously hurt your ability to profit long term. How many times have you entered a position, gained a significant profit, and then thrown it all away because you held too long? Sometimes, it is a wise move to take profits even when a position is still growing in value, simply because a downtrend is almost inevitable. The truth is, achieving the huge portfolio growth seen in previous years is nearly impossible in 2018. The market simply isn’t as profitable right now. However, there are still plenty of opportunities to take advantage of — you just have to be realistic with your goals. Expecting to double your portfolio within a month is unrealistic. Although theoretically possible, to achieve it consistently would require extraordinary dedication and more than a little luck. As such, try to set realistic benchmarks that are relative to the amount of money you invest. Think in terms of percentage improvement, rather than absolute gains. Perhaps one of the most difficult cycles to break, adding to losing positions can also be one of the most devastating mistakes a trader can make. While it is good to be confident in your choices, adding additional value to losing positions is not a tactic we recommend — particularly when the evidence is against you. We all have cryptocurrencies or digital assets that we believe in, regardless of how they have suffered in the 2018 bear market. However, belief should always be based on the evidence, rather than intuition. Don’t let your personal biases cloud your judgment, particularly when the stakes are high. One of the more common pieces of advice beginners often hear is “buy the dip.” However, if you had bought Bitcoin’s dips through its crash from $20,000 to its low of $5,800, you would have found yourself in a serious hole. The truth is, if a digital asset is in a general uptrend, the buying the dip might just work. Otherwise, it is best to only buy into positions of strength. Did we miss any big ones from our list? What was the single biggest mistake you made whilst trading cryptocurrencies? Let us know in the comments below!